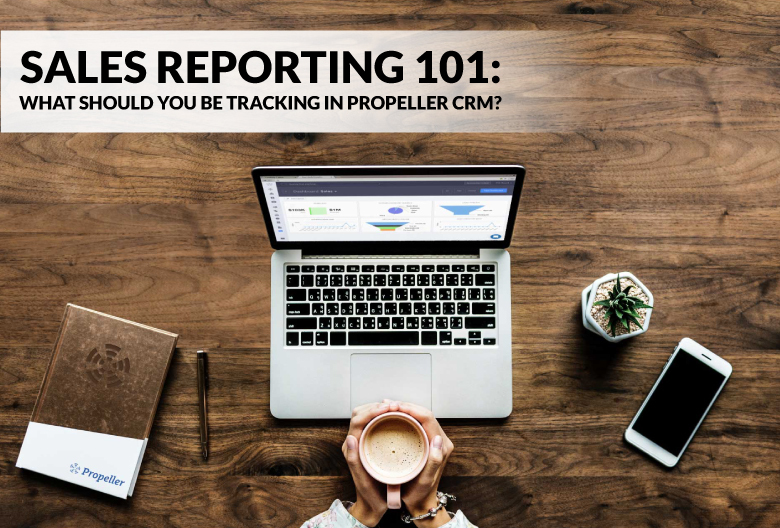 Sales Reporting 101: What Should You Be Tracking in Propeller CRM? Across all sales teams, big or small, new or veteran, startup or enterprise, one thing remains the same: sales reporting matters! And when you add a handy CRM like Propeller in your sales stack, sales reporting becomes a breeze. Not only do sales reports add some much-needed context to your sales reps’ activities, you can also use reports insights to refine your sales process and growth strategy. Among the most valuable sales metrics you should keep an eye on are sales pipeline coverage, opportunity win rate, monthly new leads, and monthly sales. Since we want you to get excited about (or at least interested in) sales reporting, we put together this list of dashboards and report types that you can create and monitor in Propeller. Even if you’re new to Propeller, it’s easy to get started with sales reporting thanks to our dashboard widgets. Once you’ve set up your first sales pipeline, you’ll want to take advantage of the various widgets you can use to build a custom summary view of your sales process. First, click on your dashboard view at the bottom of the menu on the left-hand side of your screen. Then, click on ‘New Dashboard’ (or ‘Edit’ if you’re making changes to an existing widget). From there, you can set or adjust each widget’s properties to track any aspect of your sales process. Set the widget type to the dashboard you want to create, whether it’s Revenue Forecast, Average Deal Size, Win Rate, or something else. Select the pipeline you want to track. Set a timeframe for the dates you want included. Name your dashboard so you can tell what it’s tracking at a glance. Click save, and enjoy clear, easy-to-read sales reporting! The best part of using Propeller for sales reporting? Automatic updating means you can create a dashboard for the current month, quarter, or year and Propeller will automatically generate new reports for future periods – so you have one less thing to worry about at the end of each quarter. Consistent reporting allows management to keep tabs on rep activities, makes it easier to set realistic sales quotas for your team, and can even help identify bottlenecks in your pipeline. The sooner you unearth problems in your sales process or pipeline, the sooner you can resolve issues that might be slowing your down. So, let’s take a quick look at the various dashboards you can create within Propeller – and why each of these reports are invaluable to your sales team. How quickly are new leads entering your pipeline? In order to maintain a sustainable sales pipeline coverage ratio, you need to be finding, contacting, and qualifying enough leads every month to keep your pipeline full and give your sales reps a fighting chance to make quota. A look at where your leads coming from so you know where to find more high-quality opportunities. Tracking opportunity source helps you focus your resources and optimize your sales process for higher profits and consistent success. An easy way to visualize your team’s success, your opportunities won dashboard highlights how many deals you closed in a given month and how much revenue your sales reps brought in. An opportunity win rate report reveals what percentage of total opportunities close successfully each month. Use this dashboard to track trends over time and to see what you can do to optimize your win rate further. For even more context, look at how your win rate compares to industry benchmarks. This dashboard shows you how much your average deal is worth. Tracking this metric gives you a clear idea of how much revenue each sales rep should be able to earn, whether you have enough opportunities in the pipeline to meet your quotas, and whether your business model is profitable and sustainable in the long-term. This view provides an overview of the various opportunities in your sales pipeline. While we recommend starting with a basic five-stage pipeline, you can add as many steps as you need for your sales process and create multiple pipelines for different activities, such as selling, fundraising, and partnerships. Instantly see how many opportunities have entered each stage in your pipeline – and track how long they spend at each stage to identify potential bottlenecks. Looking at where most of your opportunities stall and how quickly they move between stages helps you measure pipeline velocity, improve forecasting, and optimize your sales process. Do you know how much revenue you have in your pipeline and – just as importantly – when you can expect it to come in? Every deal in your pipeline has its own value, likelihood to close, and projected close date. You can create a weighted pipeline in Propeller to track how likely each opportunity is to close at any given stage, which leads to more accurate forecasting. Want to track your own sales activities and create your own beautiful, custom sales reports? Start using Propeller today for free!